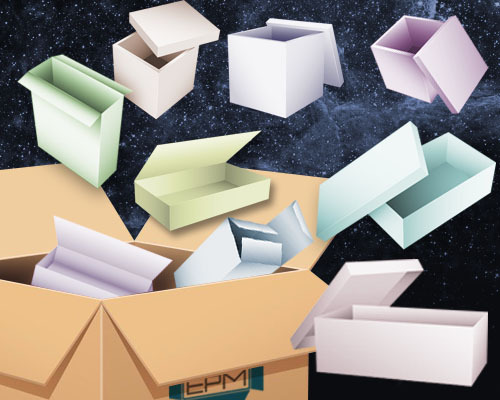 Calculates packaging standards based on ECMA or FEFCO catalog templates. Makes a drawings of cardboard packaging according to your size. The role of packaging in the modern market. In the modern market, packaging is the same element of the brand as the color solution or the shape of the product. It is carefully thought through, teams of specialists work on it, choosing the optimal size, color and shape. Remember the popular brands of mobile phones – their packaging is almost a work of art, which takes into account any details – from the type of paper to the type of embossing. The product in the package looks more representative, the gift is more expensive. If you are a small business owner or create small hand-made crafts at home – your products will only benefit and become more competitive if it is beautifully and qualitatively packaged. Packages are divided into two types: transport and consumer. The first type is needed to transport the goods and save it, the second is a continuation of the goods, protects it and helps the buyer to orient and decide on the purchase. If you want to give the extra prestige of product in the consumers eyes, then it needs a quality package, created specifically for its size. But to develop a package design is a complex process, requiring knowledge of special formulas and principles. Packaging is not just four walls. It contains many auxiliary elements, each of which is calculated by its methodology. In addition, much depends on the thickness of the material from which it will be made. As you can see, too much has to be taken into account, which increases the probability of errors. We have a simple solution! 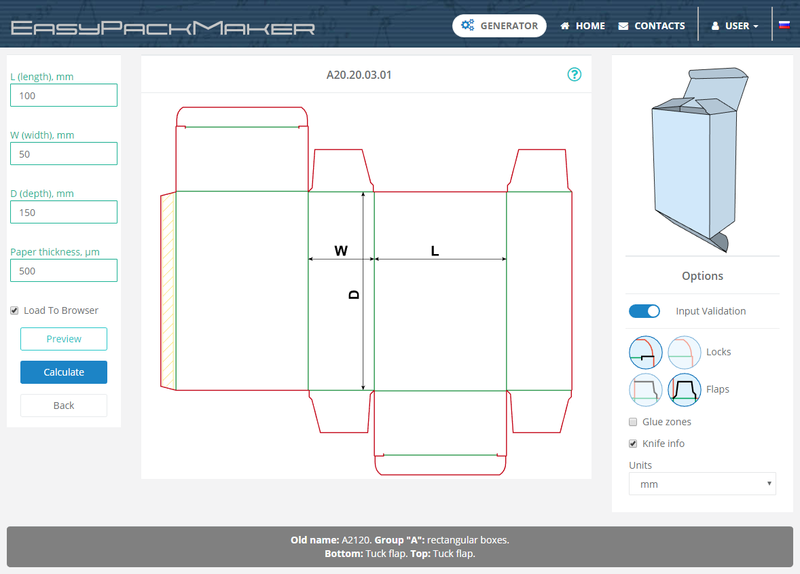 EasyPackMaker is a designer that automatically calculates a packaging model based on your data. The generator works online, right in the browser. To use it, you do not need to download third-party applications to the computer, spend time on installation and take up space on the disk. The generator contains many ready-to-use standard templates, the database of which is updated and replenished. The service is simple and intuitive – you just need to select the template you like and enter the required dimensions of the future packaging. To create the packaging you need, you no longer need to spend time on calculations on complex formulas. In addition, if an error is detected in one of the parameters of the future package, it is not necessary to remake everything from scratch – it's enough just to change the value to the desired one, and EasyPackMaker will redo the calculation in a few moments. The generator is a simple alternative to expensive and cumbersome applications. Calculate packages based on ECMA and FEFCO templates. The generator is not CAD application. Before making die-cutting stamp, always check the model for accuracy of the measurements, check the correctness of the design and the option for assembling the package taking into account the selected material. If You found any errors, please report this to the address in the Contacts section. Implemented 71 models of packaging templates from the FEFCO catalog. Group 02 – Slotted-type boxes and group 03 – Telescope-type boxes. Good news! Development of corrugated cardboard packaging models has begun. Currently, some templates from group 02 are available - Slotted-type boxes. From minor improvements: default values ​​and tooltips have been added to the generator page. Significant generator's engine update. Changed algorithms for calculating many elements of packages. Added the ability to disable automatic validation of input values. The package design preview feature has been added to the parameter input page. Significant code changes. If any bugs are found, please let us know. Seventeen templates of group "B" are added. Due attempts of Roskomnadzor to block Telegram Messenger, the site was unavailable for some providers within two weeks. We hope that this will not happen again. Facebook and VK groups created. Our site moved to a new fast hosting. Start testing the payment system. Details and tariffs on "Balance" page. It became possible to re-load the previously calculated model without entering parameters. Available on the user's personal page. Now to download the generated models, you need to register. Top 10 ranking is reset. Feedback form added. A secure SSL connection was configured. Added templates with A80, A81 codes (19 items). Templates with the "Rosette" closing system have been added. А82, A83 codes (12 items). Program code optimization. Added templates with A30, A41, A50 codes (23 items). Added templates with a gabled lid (5 items, A70 and A75 codes). Fixed minor bugs. Top 10 ranking is added. Code optimization. Fixed minor bugs. The reference section is organized. Added templates with a suspension system (8 items). Added filter to the selection page. On the input page added descriptions of template items. The database is deployed on the hosting. Changed the encoding system of templates to eight-digit, which was adopted in 2009. The database is connected. The database tables are filling. Added a measurement units switch. Fixed minor bugs. Templates of "B", "C", "D", "E" and "F" group (32 items) are added. Work on the interface continues. The validation of the input data is implemented. Added thumbnails on the selection page. Added option to display glue zones on the template. Image templates are added to the size input page. Work on the interface is suspended, work on the templates is continued. The project is deployed on hosting. Started work on the interface design. Templates of "A" group (69 items) are ready. A minimal interface has been made. Registered domain easypackmaker.com. The first template is ready – A20.20.03.01. Start of project. The incomplete ECMA Catalogue 1992 is taken as the samples of the models.